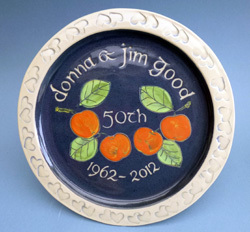 Commissions, Inscriptions and other special pieces for wedding, anniversary or corporate gifts. For special events, gifts and presentations I often make unique pieces. But please bear in mind that I make these individually to order, so give me lots of notice! 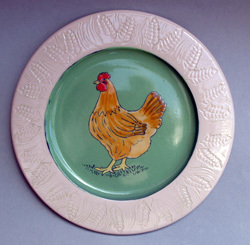 Wedding Plate, 35 cm. diameter, inscribed with the names of the couple and the date of the wedding. 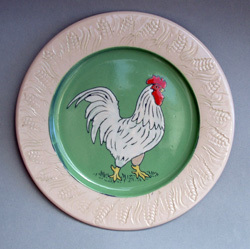 Similar plates can be inscribed for birthdays, christenings and other events. Prices on application, from €110. 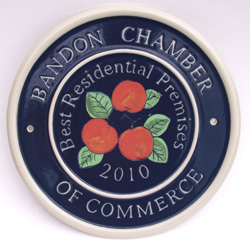 Wall Plaque, made as prize for local competition sponsored by Bandon Chamber of Commerce. Prices on application, from €120. (Depends on amount of inscription etc.). 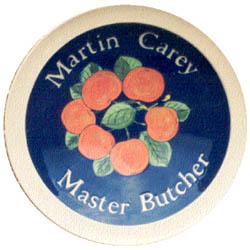 This large inscribed dish was commissioned by Martin Carey to display in his refurbished butcher's premises in Bandon. This big 36 cm. 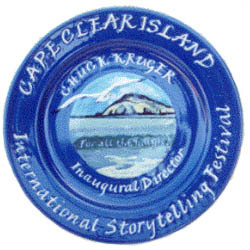 diameter plate was commissioned by the Cape Clear Storytelling Festival as a presentation for Chuck Kruger, the retiring Director. House Nameplates, approx. 31 cm. 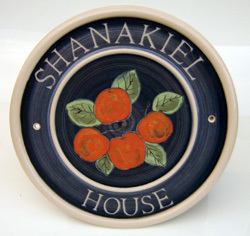 diameter, made to order and inscribed with the name of your house. These can be supplied with holes for screwing to your gatepost, or without holes, for fixing with adhesive. 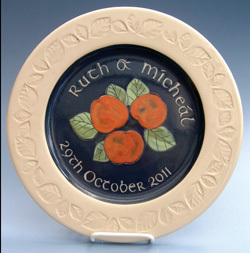 Contact usabout your Special Commissions or Corporate Gift requirements.